Between a U.S. administration that could be described as less than tech friendly and a booming Canadian tech sector that will need to fill 216,000 positions by 2021, you might think American tech workers are more likely than many to consider moving to Canada – and according to new research from Indeed.com, you’d be right. According to the job search engine’s Hiring Lab division, U.S. tech workers are nearly three times as likely as the typical American foreign job seeker to look at postings in Canada – Canadian positions accounted for nearly 30 per cent of all U.S. clicks on foreign tech postings in the six months leading up to May 2017, up from 23 per cent during the same period last year, Indeed economist Daniel Culbertson wrote in an Oct. 3 post, noting that among the general U.S. population, Canadian postings represent 12 per cent of foreign job ads read by Americans. “For Canada, this represents an opportunity to attract highly skilled talent,” he added. Indeed was one of the first companies to report a spike in Canadian searches after Donald Trump was elected U.S. president last November, Culbertson noted, and the periodic spikes in the number of searches seen in the graph above continue this pattern, peaking first during last year’s election, then during the week of Trump’s inauguration, then during the administration’s controversial executive order imposing a travel ban on seven predominantly Muslim countries. “The greater size of the tech spikes compared with the spikes for all workers shows how strong the reaction of tech talent to the current administration has been,” he wrote. 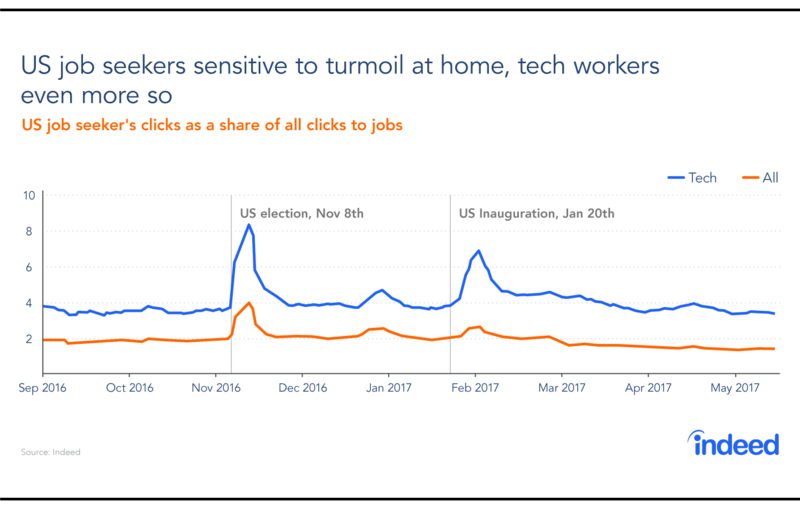 Indeed also revealed where the jobs American tech workers were clicking on were more likely to be located, though it presented the data in two ways. When measured by sheer volume of clicks, Toronto came out on top, accounting for 46 per cent of clicks from U.S. job seekers on Canadian tech jobs, followed by Vancouver with 15 per cent and Montreal with seven per cent, Culbertson wrote, noting that Toronto receives the highest share of U.S. clicks for jobs in every category. However, when the top 10 Canadian destinations were measured based on their share of total U.S. tech job seekers, a slightly different picture emerged: Ottawa, former home of Nortel Networks and current home of Shopify, became the most appealing Canadian city for U.S. tech workers, followed by Toronto, Kitchener-Waterloo, Vancouver, and Montreal. 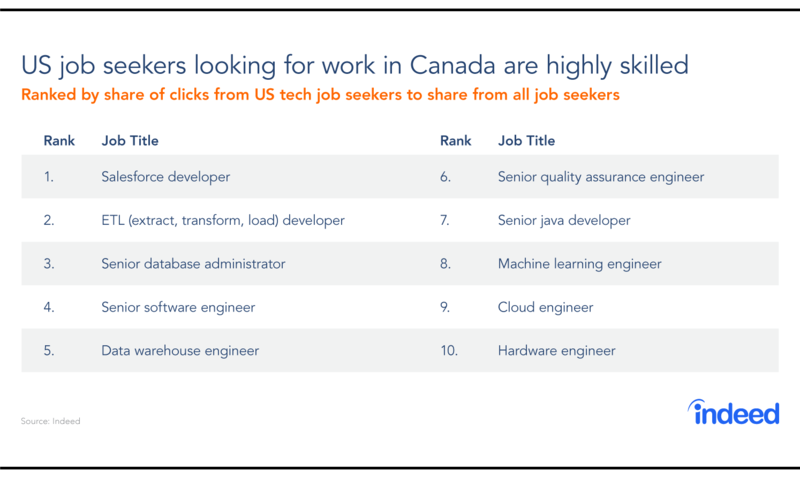 Finally, Culbertson noted that some job titles appeared more interested in moving to Canada than others: senior software engineers, senior database administrators, and machine learning engineers were more likely than other tech workers to click on Canadian ads, for example. “How much Canada can capitalize on this interest from U.S. tech workers remains to be seen,” he added.